(DESHLER, Neb. – November 21, 2017) – Reinke has been recognized by the Nebraska Corn Board with the Nebraska Agribusiness Appreciation award. Nebraska Corn Board Chairman Dave Merrell today presented Reinke President Chris Roth with the award during a luncheon held at the Cornhusker Marriott in Lincoln. 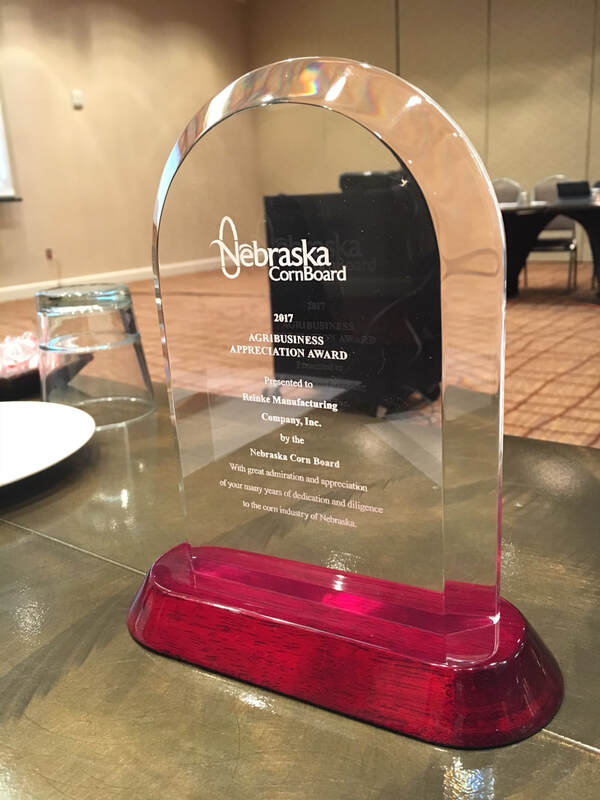 The Nebraska Agribusiness Appreciation award recognizes an agribusiness in the state that understands and appreciates the mission of the Nebraska corn checkoff program, shows proven leadership in explaining the benefits of the checkoff and its investments, and supports Nebraska agriculture. “Through their contributions and partnerships with Raising Nebraska, Reinke has done an exceptional job teaching consumers and youth about modern agriculture,” said Kelly Brunkhorst, executive director of the Nebraska Corn Board. Raising Nebraska is a collaborative effort between public and private partners focused in agricultural literacy education and is located on the Nebraska state fairgrounds in Grand Island. Reinke Manufacturing Co., Inc. is the world’s largest privately held manufacturer of center pivot and lateral move irrigation systems. Family owned since 1954, and headquartered in Deshler, Neb., Reinke develops products designed to increase agriculture production while providing labor savings and environmental efficiencies. Reinke is a continued leader in industry advancements as the first to incorporate GPS, satellite-based communications and touchscreen panel capabilities into mechanized irrigation system management. For more information on Reinke or to locate a dealership, visit www.reinke.com or call 402-365-7251.